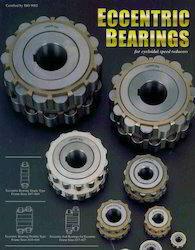 Leading Manufacturer of cyclo drives, cyclo eccentric bearing and eccentric gear hub bearing from Chennai. Cyclo Drivesare mechanism for reducing the speed of an input shaft by a certain ratio. 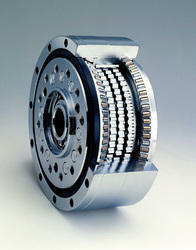 Cyclo Drives are capable of high ratios in compact sizes. The input shaft drives an eccentric bearing that in turn drives the cycloidal disc in an eccentric, cycloidal motion. 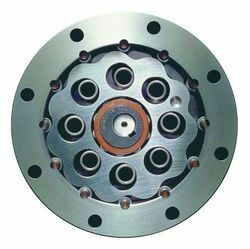 The perimeter of this disc is geared to a stationary ring gear and has a series of output shaft pins or rollers placed through the face of the disc. These output shaft pins directly drive the output shaft as the cycloidal disc rotates. The radial motion of the disc is not translated to the output shaft. It's a cylindrical roller bearing, (probably a double row in a box that size) and I would guess about 15-20 rollers. I've never done it but I would guess that you would need to set the running speed at the input speed plus the output speed due to the rotation of the disc. I've mostly used 2 x running speed as an indicator of eccentric wear. I think that's what it says in the paper but I haven't read it or done any analysis on Cyclos for a long time. I used to rebuild them though and I've got to say that that is a very tough design. I've had them brought in using water as lube and rebuilt them in a matter of hours. I was kind of scared on that one but it ran for years after new bearings, rollers and pins. Selection is based on the actual horsepower and/ortorque requirements at the outputshaft. The Cyclo® speed reducer has particularly high efficiencies over a wide range ofreduction ratios, which frequently permits the use of reduced input power requirements(smaller HP motor) without sacrificing output shaft torque. The selection procedures in thiscatalog will guide you in choosing the most efficient reducer for your application. Looking for Cyclo Drives ?